Ordering Instructions : Please Read! We feel very strongly that the stole making process should be a very personal one. We will walk you through the stole designing process. After you order we will be contacting you shortly to discuss where you would like the designs placed, what size stole is needed for your pastor, and any other special instructions. We like doing things right, and we look forward to making you the perfect stole. 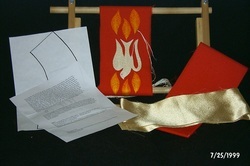 Our stoles for pastors are made from beautiful linen look fabric. 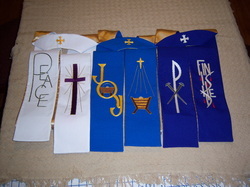 Stoles for clergy include two designs and cross on neck. Choose from our many designs. A perfect gift for ordination or graduation from seminary. Stole sets for pastors includes Red, Blue, White, Green, and Purple for $700. Stole sets include two designs and cross on neck for each stole. Choose from our many designs. Add a Black stole for your favorite pastor for only $120. $45 Includes fabric with two of our designs ready for you to embroider, satin fabric for backing, interfacing, neck pattern, and instructions. See our online instructions and helps for additional online support. (Frame, Needle, and Floss not included) A perfect gift for the seminarian or pastor in your life.